From left to right: Mary Frawley, Giang Truong, Ramgopal Madugani, Laura Russell, Ali Maimaiti, Mark Daly, Yong Yang, Ravi Kumar, Eugen Prel, Vibhuti Bhushan Tiwari, Síle Nic Chormaic, Momoko Zamami. We are interested in studying the interaction between light and matter in a number of regimes, including cold atomic systems, whispering gallery mode microresonators and biological specimens, in order to gain a better understanding of the processes involved and to manipulate or trap micron and nanoscaled particles using light fields. Nano-optical fibers are used as the interface tool between the light source and the sample under investigation. The propagation of higher modes, such as the LP11 mode, in optical nanofibers using the exponentially tapered optical fiber as a basic model has been investigated. In order to preserve the LP11 mode in the downtaper as far as the nanofiber waist, the effect of varying the cladding-core radius ratio on the LP11 adiabatic criterion was modeled. A Laguerre-Gaussian beam was created in free space using a spatial light modulator (SLM) and coupled to a few-mode fiber (Fig. 1). This device allows convenient switching between the fundamental and LP11 fiber modes. By selecting a few-mode fiber with a relatively low cladding-core ratio, the propagation of the LP11 mode down to a submicron waist has been maintained. Furthermore, by observing the transmission profile during tapering, it is possible to decisively terminate the pulling process in order to eliminate the two degenerate HE21 modes of the LP11 mode. As a result, a nanofiber can be fabricated through which only the TE01 and TM01 components of the LP11 mode propagate. Such a nanofiber has promising applications in the area of mode interference for controlled particle trapping sites. Fig. 1 (a) Experimental setup for beam shaping. The beam is expanded and incident on the SLM screen, where it is converted to a LG01 beam in the first order. It is then focused to the Fourier plane, and coupled to the fiber. (b) Example of hologram used to create the LG01 beam, in which the characteristic forked pattern of the phase discontinuity is evident. (c) Images of the LG00 (top) and LG 01 (bottom) beams from the SLM. These modes are converted to LP01 (top) and LP11 (bottom) modes in the fiber. The LP11 beam can have either a doughnut or lobed profile, arising from the combination of the doughnut-shaped, true modes. The circularly symmetric profile in the case of LP01 and the dark line at the center in the case of LP11 are evidence of good mode purity with this method of excitation. A silica microsphere on a low spring constant cantilever (pendulum) was fabricated and evanescently coupled to a tapered optical fiber. The motion of the pendulum was detected as variations in the transmitted laser power through the tapered fiber. 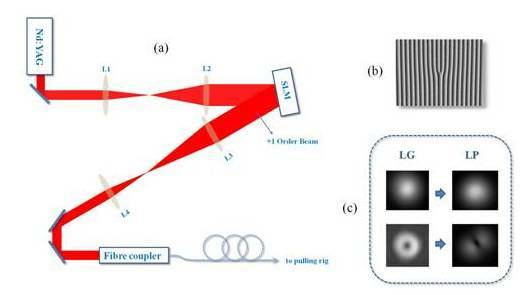 The optical coupling noise created by the pendulum motion was recorded by taking a fast Fourier transform (FFT) of the transmitted laser power and the fundamental mechanical mode of the pendulum at 1.16 kHz was observed. The thermal damping and amplification of the coupling noise was investigated and the effect of the thermal feedback on the noise spectrum was examined (Fig. 2). The response of the thermo optical feedback to small transient and driven variations in the taper/pendulum separation for different values of laser detuning was demonstrated. Preliminary results on the optical force between the pendulum and the tapered fiber can also be studied. Microspherical pendulums, with low mechanical spring constant, could be used for studying nanoscopic optical and mechanical forces, or optical cooling. Fig. 2 The Lorentzian shaped line represents the microsphere resonance. (a) and (b): Negative thermal feedback (warm stable equilibrium). A decrease in laser power, temperature, or coupling is compensated for by a blue shift of the resonance towards the pump laser. An increase in power, temperature, or coupling is compensated for by a red shift away from the pump laser. (c) and (d): Positive thermal feedback (unstable equilibrium). A decrease in laser power, temperature, or coupling is further decreased by a blue shifting of the resonance away from the pump laser. An increase in laser power, temperature, or coupling is further increased by red shifting away from the pump laser. Tapered (or nano) optical fibers provided a unique and non-destructive technique to probe laser-cooled atom characteristics and have exciting prospects in the development of novel trapping geometries for cold atoms. In this work we presented a method for measuring the average temperature of a cloud of cold 85Rb atoms in a magneto-optical trap using an optical nanofiber. A periodic spatial variation was applied to the magnetic fields generated by the trapping coils and this caused the trap center to oscillate, which, in turn, caused the cloud of cold atoms to oscillate. 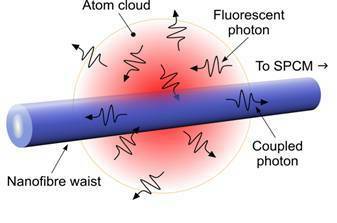 The optical nanofibre was used to collect the fluorescence emitted by the cold atoms (Fig. 3), and the frequency response between the motion of the center of the oscillating trap and the cloud of atoms was determined. This enabled us to make measurements of cloud temperature both above and below the Doppler limit, thereby paving the way for nanofibers to be integrated with ultracold atoms for hybrid quantum devices. Fig. 3 Schematic of the atom cloud overlapping the nanofibre, illustrating the coupling of fluorescence photons to the guided mode of the fibre. Our unit is interested in spherical resonators, i.e. whispering gallery resonators, for applications into sensing, cavity QED, optomechanics and photonics. 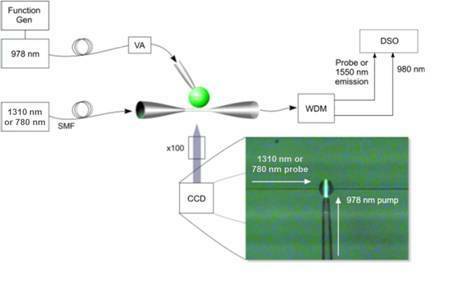 Recently, we presented experimental results on an all-optical, thermally-assisted technique for broad range tuning of microsphere cavity resonance modes to arbitrary probe wavelengths (Fig. 4). An Er:Yb co-doped phosphate glass (Schott IOG-2) microsphere is pumped at 978 nm and the heat generated by absorption of the pump light expands the cavity and changes the refractive index. This allows fine tuning of the microsphere’s whispering gallery modes. Pump/probe experiments were performed to demonstrate thermo-optical tuning to specific probe wavelengths, including the 5S1/2 F = 3 to 5P3/2 F' = 4 laser cooling transition of 85Rb. 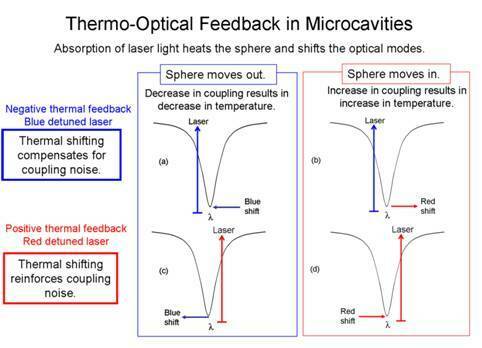 This is of particular interest for cavity QED-type experiments, while the broad tuning range achievable is useful for integrated photonic devices, including sensors and modulators. Fig. 4 Schematic of the experimental setup. Inset: Image of the microsphere with visible 978 nm light pumped via the stem. WDM: wavelength division multiplexer, VA: electronic variable attenuator, SMF: single-mode fiber, DSO: digital storage oscilloscope. Laura Russell, K. D., Daly, M., Morrissey, M., Nic Chormaic, S. Sub-Doppler temperature measurements of laser-cooled atoms using optical nanofibres. Meas. Sci. Technol. 23, 015201 (015208pp) (2011).